Tokyo, Japan - December 14, 2016 - NEC Corporation (NEC; TSE: 6701) today announced that its subsidiary NEC Corporation (Thailand) provided the Thailand Electronic Transactions Development Agency (ETDA) with hands-on cyber defense training for government agencies in the country. The training was held in Bangkok, Thailand from 6 to 9 December, for more than 50 government officials from the ETDA and other government agencies. The ETDA, which is under the jurisdiction of the Ministry of Digital Economy and Society, is one of the agencies responsible for cyber security in Thailand. As part of this, the ETDA operates ThaiCERT, the Computer Security Incident Response Team (CSIRT) responsible for handling computer security incidents in the country. NEC's hands-on cyber defense training aims to enhance the abilities of system administrators in government agencies to effectively handle the increasing threat of cyber-attacks. By providing simulations of a customer's ICT infrastructure, the practical training enables the cultivation of system administrators with comprehensive cyber defense capabilities. "We are proud to be selected as a partner for providing cyber defense training programs for government agencies in Thailand," said Takayuki Kano, President, NEC Corporation (Thailand). "Building on NEC's successful track record in the field of cyber security, we look forward to reinforcing our ties with government agencies throughout the world in the cultivation of personnel who defend against cyber-attacks." The program capitalized on simulated government office network environments to provide students with valuable first-hand experience in handling a full cyber-attack, from the onset of an information security issue, to its final resolution. The training not only imparted technical skills in handling a cyber-attack, but provided important organizational measures for preventing the spread of damages, including possible instructions for staff and the sharing of information with related institutions. In April 2015, Japan's Ministry of Internal Affairs and Communications (MIC) and Thailand's Ministry of Information and Communication Technology (now the Ministry of Digital Economy and Society) issued a joint statement announcing that the two countries would expand their existing cooperation in cyber-security and cooperate in the area of mission-critical ICT infrastructure protection. Under this agreement, Japan is expected to contribute to cyber-security in Thailand through provision of its advanced technologies. 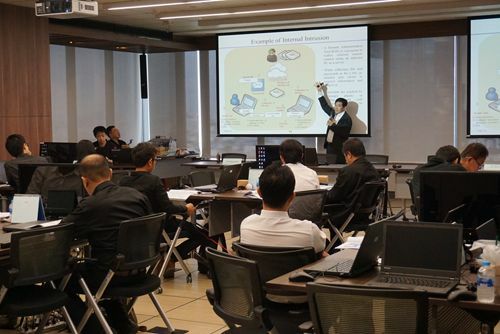 In November 2015, NEC, in collaboration with the Embassy of Japan in Thailand, provided hands-on cyber defense training for government agencies in Thailand through a project commissioned by the MIC. This training was similar to the MIC's "Cyber Defense Exercise with Recurrence (CYDER)" provided in Japan. NEC regards this new contract with the ETDA as recognition of the success of the project in 2015.